What a great title to go with a very interesting photo. 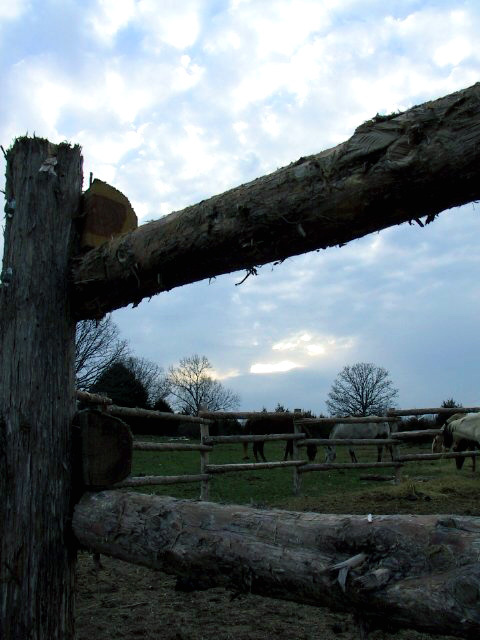 I love the texture of the wood, and the way that you have framed the horses into the shot! Very creative way to solve this challenge! I love horses too!! This photo is a little to dark in the detail, but the sky is beautiful. Nice composition! I hate to rag on people for creative interpretation, but... Fences aren't architecture. This is a beautiful picture. Nice framing. Sort of like building your photo with the architecture you were capturing. I like the way you've interperted architecture. Very nice use of contrast, and great detail as well as focus selection. Very nice shot.. personally I like it with the top sky cropped out. I like how you framed the horses within the fence. It pulls my eye to them. must have been difficult to get good DOF in this shot. good idea. everything but the sky is a bit dark and muddled... a brighter exposure might be nice. Proudly hosted by Sargasso Networks. Current Server Time: 04/18/2019 09:08:51 AM EDT.